Location: Villeneuve-d'Ascq, in the Nord departement of France (Nord-Pas-de-Calais Region). Ownership / Access: Ville de Villeneuve-d'Ascq. Notes: Château de Flers (also sometimes called Ferme d'en Bas) is a cat the way castle located in Boots in Villeneuve d'Ascq, in the Northern Department. It houses the Castle Museum of Flers and the Tourist Office of Villeneuve d'Ascq. It takes its name from the ancient village of Flers-lez-Lille near which it is located. 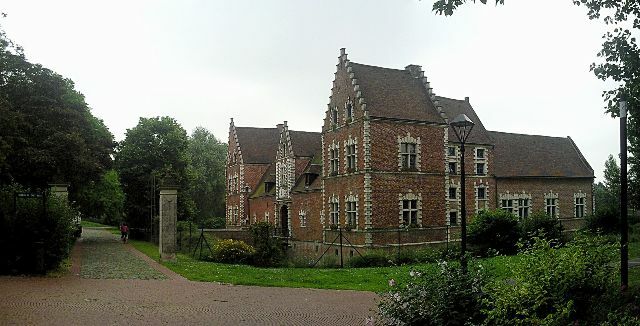 The castle is characteristic of rural Flemish architecture of the seventeenth century. It consists of two wings at right angles, one north and the other west. Originally it had a third wing to the east. Backup works are conducted by architects Maurice Salembier and Emmanuel Turcry during the years 1974-1975 and 1979. The internal refurbishment work is undertaken by the city of Villeneuve d'Ascq from 1986 to 1991. Four halls in -sol are converted into archaeological museum since 1991. the museum also features temporary exhibitions highlighting archeology, local history and regional ethnography.